How do I find out what firmware version a phone is running? How do I update the firmware version for a phone? Once a phone is in use, details and status information about a phone appear in the phone information panel on the Phone tab. The phone information panel appears on the Phone tab. Indicates the overall status of the phone and the line key connection to an Edge. Hover your mouse pointer over the status icon to see specific details. Use Restart Phone to reboot the phone. When you reboot the phone, it will essentially be re-provisioned. In the process the phone will check for a firmware version update. If an update is available, the new firmware will be installed. Indicates the status of the phone’s registration and line key connection to the Primary Edge. Indicates the status of the phone’s registration and line key connection to the Secondary Edge. Hover your mouse pointer over the status icon to get specific details. Lists the make and model of the phone. Hover your mouse pointer over the information icon to reveal additional details. 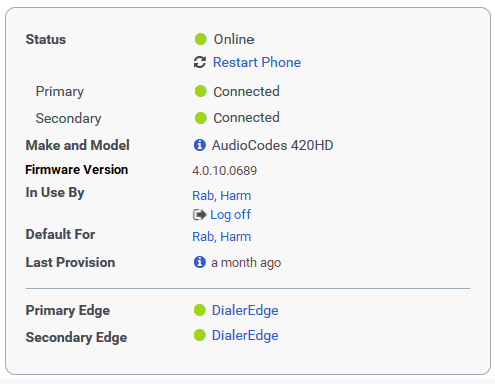 Firmware Version Identifies the firmware version running on the phone. Lists the name of the person to whom the phone is assigned. Use Log off to disconnect the person from the phone. Default For Lists the name of the person who is specified as phone’s default user. The length of time since the phone was provisioned. Hover your mouse pointer over the information icon to see the exact date and time that the phone was provisioned. You can also see the IP address of the provisioning server. Indicates the status of the primary Edge’s connection to the cloud. Indicates the status of the secondary Edge’s connection to the cloud.